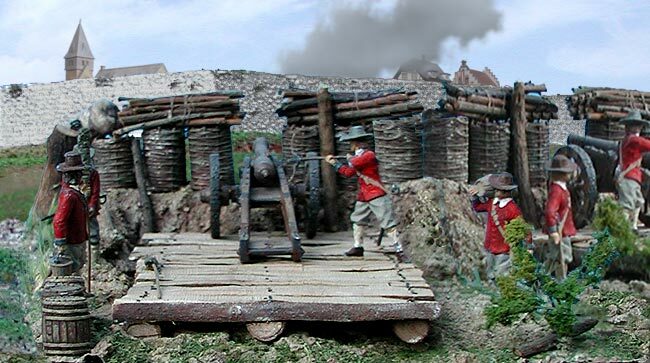 As the saps came closer to the main fortification and its outerworks, ancillary forts and citadels, batteries of cannons were sited on new ground, nearer to the target. Presumably, placing batteries closer in was possible because cannon back near the line of countervallation had knocked out some or most of the defenders' cannon on that side. Otherwise, the gabions and fascines put up around the new batteries would have been easily penetrated by cannonballs from heavy cannon. Batteries were advanced to the fort and became little fortresses themselves. The nearer a battery was to the fortifications, the more urgent was the need to adequately protect it from enemy sallies. Trenching was dug around the perimeter of the battery, infantry stationed there, and even a wooden palisade was sometimes erected to supplement the piled earth, gabions and fascines. 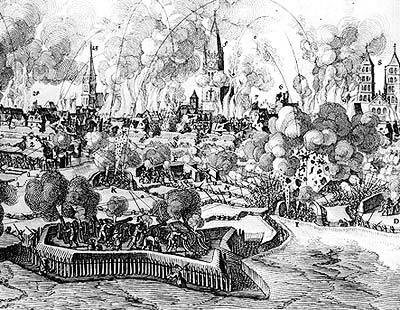 If some of the defender's artillery remained functioning, it retaliated with deadly effect upon any besiegers behind their thin protection as suggested by Blaise de Monluc who described the defenders' return shots during the Siege of Siena, 1554: "The third shot lighted upon the bottom of the gabions, and the fourth played directly into their artillery and there killed a great many of their men; whereupon all those that assisted fled behind a little house which was in the rear of their cannon. At which I ran and took him (artillery officer de Bassompierre) in my arms, and seeing him with linstock ready to fire again, said to him, 'My brother, let them have it; I'm giving you another ten escudos and a beaker of Greek wine.'" After the besieged's cannon had been sufficiently quieted (with casualties inflicted upon the defenders), AND they came sufficiently close (like within 100 meters), the besiegers could turn their attention to breaking down a wall. The wise general who led the attacking forces had already gleaned information about the fort, in particular any weaknesses, from spies, scouts, sallies, prisoners, and blabbery civilians. Against a potential vulnerability he had his cannon turn and give fire. The artillery pounded for however long it took to break down that spot.